NETWORK FINALS: THE GOLDBERGS, LETHAL WEAPON and SPEECHLESS gained 0.1 in final numbers. CABLE HIGHLIGHTS: Discovery’s ALASKAN BUSH PEOPLE topped Wednesday cable, up 0.13 to 0.81, with lead-out BERING SEA GOLD up 0.05 to 0.46. A pair of ESPN COLLEGE BASKETBALL games were in the Top 4, with Louisville vs. North Carolina at 0.67, and Duke vs. Syracuse at 0.53. On VH1, BLACK INK CREW fell 0.09 to 0.64, and AMERICA’S NEXT TOP MODEL was up 0.01 to 0.29. FX’s LEGION dipped 0.04 to 0.49; interestingly, though, it was actually up in the younger (and more valuable) P18-34 and both male and female 12-34 demos. On HGTV, PROPERTY BROTHERS dropped 0.05 to 0.41. On Lifetime, LITTLE WOMEN ATLANTA ticked up to 0.40, and the season finale of VIVICA’S BLACK MAGIC was down 0.05 to 0.13. TLC’s MY 600-LB LIFE rose 0.03 to 0.39, and the season finale of TOO CLOSE TO HOME was up 0.04 to 0.30. ID’s SEE NO EVIL grew by 0.07 to 0.38, and MURDER CHOSE ME held at 0.34. On MTV, ARE YOU THE ONE ticked up to 0.38 (with a 0.14 AFTER-SHOW that was down 0.02), preceded by a TEEN MOM special that was down 0.02 from last week’s installment to 0.29. 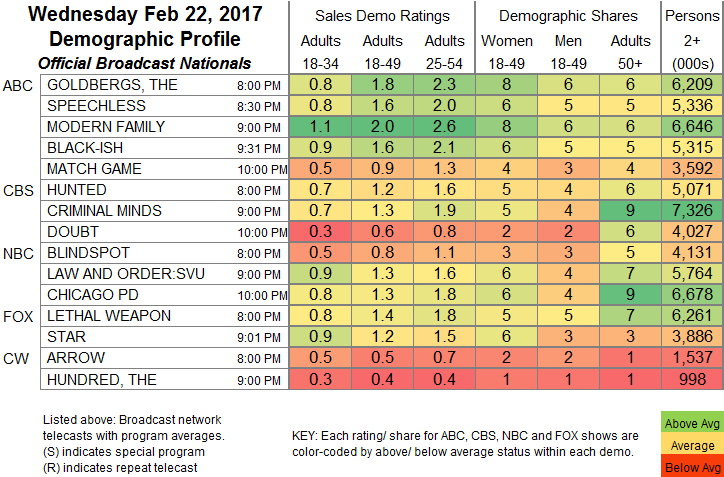 Syfy’s THE MAGICIANS grew by 0.07 to 0.36, and THE EXPANSE was up 0.06 to 0.20. History’s just-renewed SIX was steady at 0.36. Nickelodeon’s late-afternoon LOUD HOUSE was again in the Top 15 at 0.36, with lead-out BUNSEN IS A BEAST at 0.26. On FXX, IT’S ALWAYS SUNNY IN PHILADELPHIA ticked down to 0.34, and MAN SEEKING WOMAN was up 0.02 to 0.12. USA’s SUITS remained at 0.32. Food Network’s BAKERS VS FAKERS was steady at 0.31. BET’s THE QUAD rose 0.04 to 0.31, airing after a 0.16 ABFF HONORS special. On Comedy Central, WORKAHOLICS gained 0.04 to 0.31, and JEFF & SOME ALIENS was steady at 0.14. TNT’s MAJOR CRIMES returned at 0.23, way down from last fall’s 0.38 finale. 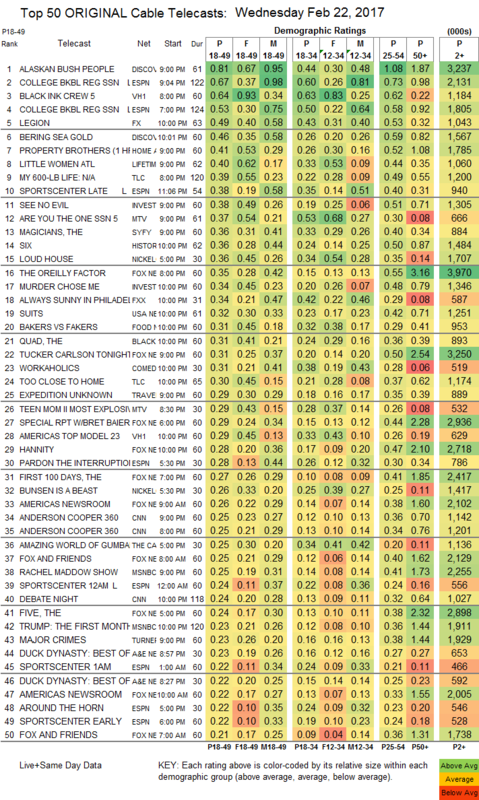 On A&E, the season premiere of JEP & JESSICA was at 0.20/0.18, airing after 0.23/0.22 “best of” DUCK DYNASTY episodes. Tru’s THE CARBONARO EFFECT fell 0.09 to 0.17. The season finale of Bravo’s GIRLFRIENDS GUIDE TO DIVORCE remained at 0.11. E!’s SO COSMO held at 0.08. Note that we don’t currently have any ratings below the Top 150, so no numbers for POP’s SCHITT’S CREEK, but its rating would be at 0.06 or below.